See our previous post on Aleppo here. In this post we will continue to look at some of the interesting artifacts displayed in the Aleppo National Museum at the time of our visit in 2002. The Amorites. The Amorites are described as “the inhabitants of the land west of the Euphrates River, which included Canaan, Phoènicia, and Syria” (Youngblood, Bruce, and Harrison, Nelson’s new illustrated Bible dictionary 1995). Here is a summary of information about the Amorites from the same article. Amorites were one of the major tribes, or national groups, living in Canaan. The Old Testament frequently uses “Amorites” as a synonym for Canaanites in general. The Book of Genesis cites Canaan as the ancestor of the Amorites (Gen. 10:16). Before 2000 B.C. the Amorites lived in the wilderness regions of what today is western Saudi Arabia and southern Syria.… Beginning about 2000 B.C., they migrated eastward to Babylonia in large numbers. There they captured major cities and regions from the native Mesopotamians. “Abram” is an Amorite name, and Abraham himself may have been an Amorite. Throughout Old Testament times, other Amorites remained in Syria, Phoenicia, and the desert regions to the south (Joshua 13:4). A significant number, however, settled in the land of Canaan itself, eventually occupying large areas both east and west of the Jordan River (Judges 11:19–22). These Amorites spoke a dialect that was closely related to Canaanite and Hebrew. Occasionally, the Amorites were identified as a Canaanite tribe (Genesis 10:16). At other times they were called the people of Canaan (Deuteronomy 1:27). During the invasion of Canaan, Joshua and the Israelites defeated Amorite kings Sihon and Og, rulers east of the Jordan River (Joshua 12:1-6). Various cities west of the Jordan—Jerusalem, Hebron, Jarmuth, Lachish, and Eglon—also were called “Amorite” cities (Joshua 10:5), even though Jerusalem was also known as a Jebusite city. While conquering Canaan, the Israelites frequently fought with the Amorites. After the Israelites prevailed, the Amorites who had not been killed remained in Canaan and became servants to the Israelites (1 Kings 9:20–21). The Amorite Spring Goddess from the 18th century B.C. 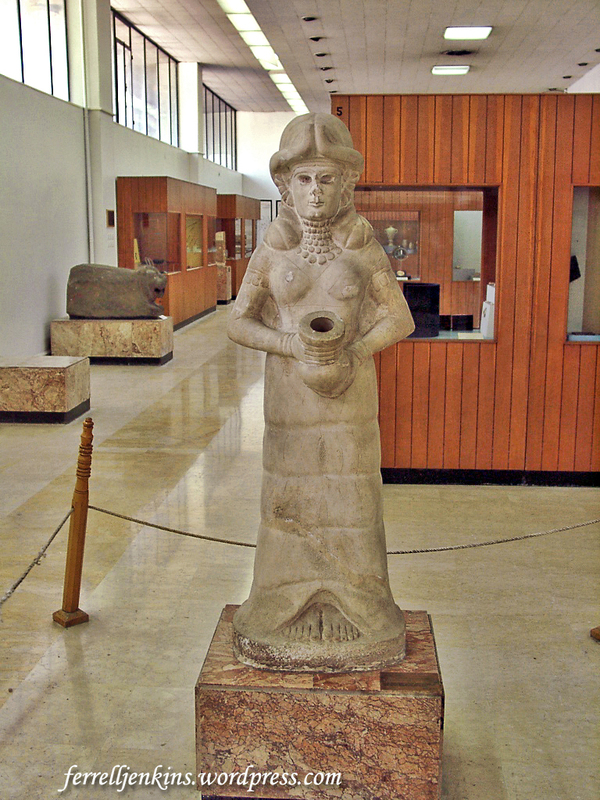 When I walked in the door of the Museum and saw the impressive statue of an Amorite Spring Goddess I recalled the work of French Archaeologist André Parrot and his comments about the Gushing Vases of Mesopotamia that are displayed in the Louvre. Amorite Spring Goddess from the 18th century B.C. displayed near the main entry of the Aleppo National Museum. Photo by Ferrell Jenkins. In his book Land of Christ, Parrot calls attention to the statement of Jesus in John 7:37-38. “is an extraordinary and impressive reminiscence of Mesopotamian iconography: monuments from the 3rd, 2nd, and 1st millennia often have representation of male or female deities holding waist-high, in both hands, a vase from which water flows. Rivers literally flow from the heart of the personage represented. Two scholars, Rudolph Bultmann and Millar Burrows, have made the same comparison. They do not explain it, nor do we, but it is nonetheless striking” (page 102). In our next post on this subject we will show some of the Hittite artifacts. This entry was posted in Archaeology, Bible Lands, Bible Study, Old Testament, Photography, Travel and tagged Aleppo National Museum, Museum, Syria. Bookmark the permalink. There is much I do not know about the Amorites, but in my own mind I see harmony between the comment in the Nelson’s Bible Dictionary and the point you make from Genesis 10. Many scholars speak of the Amorites of Syria, the region around Aleppo, as “Western Semites.” Here are a few comments for further study. Andre Parrot, excavator of Mari, says, “Successive waves of ‘western Semites’, otherwise called Amorites, break through and capture the defences one by one, securing bases in the heart of the country of the Sumerians” (Discovering Buried Worlds, p. 79). K. A. Kitchen refers to “the Western Semites, known to the Sumerians as Martu and to the Babylonians as Amurrites (‘Amorites’), both terms meaning simply ‘Westerners.’” (The Bible in its World, p. 34). See also Keith N. Schoville, “Canaanites and Amorites” in Peoples of the Old Testament World. The article from Nelson’s Bible Dictionary that you summarized suggested that Abraham may have been an Amorite. But how could this be? The Amorites were descended from Canaan the son of Ham the son of Noah according to Genesis 10. But Abraham was descended from Noah’s son Shem according to Genesis 11.